Women of the Far Right delves into a fascinating subject: the mothers’ movement, the loosely organized and often internally divided groups of women opposed to America’s involvement in World War II. Some of the women were vehemently anti-Semitic. Others started off as anti-communists. One female pilot was secretly employed by the German government. All were united as women and mothers opposed to American boys being killed in a foreign war. During the peak of the mothers’ movement, millions of American women were counted as members. Glen Jeansonne , a professor at the University of Wisconsin-Milwaukee, is clear that the women he describes are “extremists” and “bigots,” and he expresses such opinions throughout the book. Given that many of his sources are reports compiled by the federal government, the American Jewish Committee, the Anti-Defamation League (ADL), and the American Jewish Congress, I didn’t expect to read anything positive about the women of the far right. However, the women’s bravery shines through in their stories despite the author’s own bigotry. 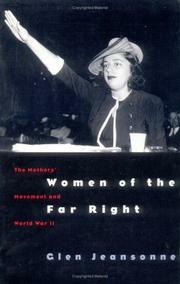 Women of the Far Right details the various mothers’ movement organizations, their publications, and activism. This review does not follow the chapters of the book, but instead focuses on several leaders. For a while, her efforts centered on investigating colleges, making lists of books on Marxism and by Freud in the libraries. Henry Ford (who paid for her office furniture and had her on his payroll for six months) paid her $5,000 to investigate the University of Michigan, and the Los Angeles Chamber of Commerce paid her to investigate UCLA. In 1933, she started compiling a list of communists and related subversives, working 12 to 14 hours a day for a more than a year. The result was the self-published, 352-page book The Red Network: A Who’s Who and Handbook of Radicalism for Patriots . Tens of thousands of copies were sold or given away over the next few years, with assistance from the KKK, the German-American Bund, and Daughters of the American Revolution (DAR). Some chemical and ammunition companies bought and distributed copies, with hopes that the Red Scare would increase sales of tear gas and ammo to use on the communists. A German magazine titled Dilling the “female führer” of the U.S. 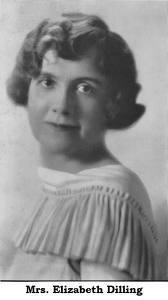 Her next book, The Roosevelt Red Record and Its Background , was published two weeks before the 1936 presidential election. She spoke out against FDR’s “Jew Deal,” the centralization of banking, the progressive income tax, abolishing private property, restrictions on inheritances, welfare, and laws against private possession of firearms. She also was critical of Eleanor Roosevelt, claiming FDR was too weak a man to control his own wife. 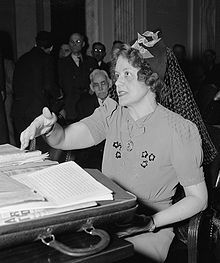 Dilling remained an activist after the war, and was critical of Eisenhower, JFK, Barry Goldwater, the Vietnam War, and “kosher conservative” William F. Buckley Jr. She became an avid reader of the Talmud, and began signing her name “Elizabeth Dilling, D.D.T.,” which stood for “Doctor of Damned Talmud.” In 1964, she and her second husband published The Plot Against Christianity . She died two years later.